Have fun with this flyer filled with 20 oz. 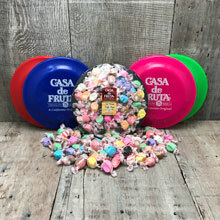 of assorted salt water taffy. Color choices are red, blue, green, pink, and black. Please specify color selection in Comments or one will be chosen for you.